Paladino and his racist email. I'm sure there's a distinction to be drawn between racist emails and racists, so to be fair, we should note that not all racists use email. But, you know, the Tea Party isn't racist, it just supports racists. How can a poor man stand such times as this and live? Just a quick follow up/final thought (for now) on this Todd Henderson incident. If you and your spouse are pulling down somewhere between $250,001 and $400,000 per year and you are worried about the impact of Obama's tax cuts, that's understandable. And, if you're worried about having to fire "the (legal) immigrant from Mexico who owns the lawn service we employ", that's admirable. Why doesn't he just explain his situation to the guy that cuts his lawn? He could just say, "Hey, pal, I'm sorry that we can't afford the $20/week we had been paying you to cut the lawn. See, there's this tax hike coming that may or may not raise our taxes because we make somewhere between 250k and 400k a year. Could you cut us a break during these tough times and cut the lawn for $10/week?" Just level with him. The guy mows lawns for a living, so he's got to understand the plight of the working man. A man plays a tiny (and likely quite valuable) violin here. Because Obama proposes to let the Bush tax cuts expire only on “incomes above $250K”, I was surprised that Prof. Henderson expected to be importantly worse off under the president’s plan, so I went here and plugged in what seemed to be reasonable numbers. He says his family’s “combined income exceeds the $250,000 threshhold for the super rich (but not by that much)” . I tried $140,000 each for him and his wife, $5000 in charitable deductions, and a 5% mortgage on a million-dollar house, which is what would cost about $15K in property tax per year in Chicago, with 80% 20% down [thanks JHA]: $40,000 per year in mortgage interest. Under Obama’s plan, his federal tax would be $48,333, and his Illinois tax about $8400 (3% of AGI). Under current law (Bush tax cuts), $55,600 + $8400. Oops; what happened? Obama will greatly ease his AMT hit, and his taxable income is less than the $250,000 cutoff. If all the Bush tax cuts expire, his income taxes will be the same as now, $55,600, again because of AMT changes. But wait a minute: he says he’s paying “nearly $100,000″ in state and federal taxes, not including sales tax; let’s say $95,000. Leaving out his property tax, that’s $80,000 in income tax. How much income would lead to this kind of tax hit? I had to experiment with the calculator a little, but it’s a little less than $170,000 apiece. So his pretax family income exceeds $250,000 by at least $90,000. But this doesn’t include tax-free contributions to their 401Ks: anything they are socking away for retirement adds to his actual income; unless they’re at the $33,000 limit they must just like to pay taxes, or are too stupid to be walking around professing and treating sick kids. So we’re pretty close to $400K gross income, and on top of that their employers are surely putting money into their retirement funds. I guess $150,000 is “not that much” in some circles. His taxes will go down $3700; he can buy one of those ties every two weeks! And this guy is threatening to fire the gardener and the house cleaner, take the kid out of art class, turn off his cell phones, and try to raise competent adults with only basic cable. Prof. Henderson, I’m ashamed to share my profession with you. Strict liability may have its legal purposes, but seems irrational as a moral position. I think that's at least half wrong. Not sure about the legal part, but the moral part is off base. I've been thinking about doing some "experiments" to see what the folk think. The data I've seen suggest that the folk buy into strict liability as a moral doctrine. It's one of the few times I think the folk are alright. The chart that explains everything! What's this chart a chart of? 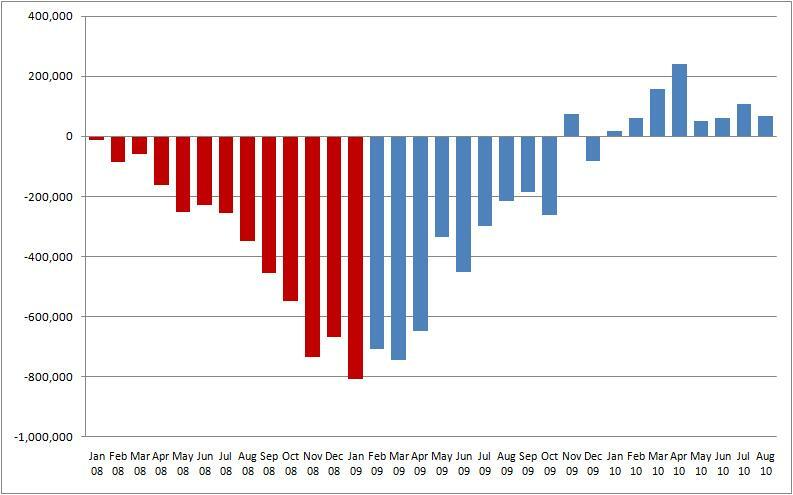 It shows monthly job losses or gains in the private sector since the start of the Great Recession. 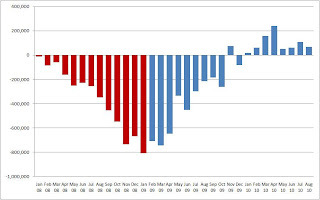 Red bars are months under the Bush administration and blue bars are months under the Obama administration. Really, I think the chart explains everything. I'm looking for discussions of non-propositional conceptions of evidence. In particular, I'm looking for articles or books where someone argues for a non-propositional conception of evidence. 1. A sufficient stock of authors arguing for a propositional conception of evidence. 2. A sufficient stock of authors who speak of evidence as non-propositional without offering arguments. 3. Material from Moser, Davidson, and Pollock in which they offer reasons for thinking of evidence in terms of something other than facts or propositions. I've also collected more material responding to these arguments than I need. If there's something you've seen that's worth taking a look at, please let me know. I'm working on a writing project where it would be good to have a discussion of propositional vs. non-propositional conceptions of evidence.